The Sarah Maples Chapter of DAR met at the Cedar Creek Library in Seven Points to hear our speaker for the month of April. 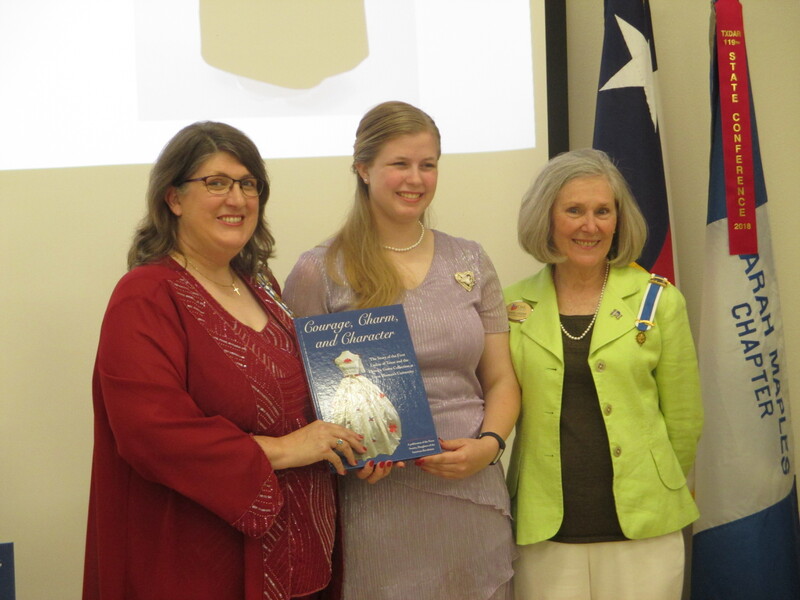 Ellen Samek was our speaker and her topic was the Texas First Ladies Gown Collections at TWU. The Collection is much more than a chronology of fashion. Progressing from the 1800s through industrialization of the 1900s, the First Ladies of Texas have become icons of grace and compassion. Each woman leaves her own legacy, but all share common threads that seamlessly stitch together Texas’ First Ladies’ assorted patchwork of experience. TWU hopes that visitors will also see the Collection as a springboard into the living history of Texas Women. Texas Women’s University will welcome you to enjoy this fascinating collection of gowns and encourages you to see beyond the heirloom garments and into the chambers of Texas past. This Collection currently displays 21 of the 47 gowns, of which 46 are owned by the University and one is on loan. The display changes at various times throughout the year so that a visitor can enjoy different gowns in the Collection with each walk through the hall. Across from each gown is information about the respective First Lady and the gown displayed. Each dress has been loaned or donated by various sources to the University. Restoration, storage and upkeep of the collection is made by generous donations from the community including the Texas Society of the Daughters of the American Revolution and the Denton Benefit League. The scarlet red gown worn by Texas First Lady Cecilia Abbot during her husband Gov. Greg Abbott’s Inauguration is the latest addition to the Texas First Ladies Historic Costume Collection at Texas Women’s University. It is a scarlet red, couture ball gown made with peau de soie silk satin.It has a fitted bodice with 3/4 length sleeves. The neckline and sleeve cuffs feature a spectacular detail of Spanish guipure lace Swarovski crystals, various ruby colored beads and enhanced with gold and rhinestone accents. The full shirt has pleats, a slight train and pockets for comfort. The finishing touch is a belt at the waistline with layers of leaves forming a beautiful floral-like bouquet. the gown was made by seamstress Laura Gonzalez. Ellen’s daughter Kristen did a wonderful job with the slideshow of the gowns and telling us which gown belonged to which First Lady. Kristen is looking to make a career in the fashion industry. She has worked on projects and service with clothing and textiles. Her mother Ellen joined DAR 20 years ago through the Chipola Chapter in her home state of Florida. After marrying her native Texan husband she relocated to the Lone Star State. She transferred her DAR membership to the Benjamin Lyon Chapter in Denton. She was invited to serve as Co-Chair of the DAR Texas First Ladies Historic Gown Collection at TWU. She loves reading and history, and hanging out with her husband and family.